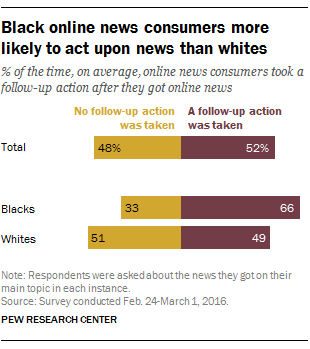 When getting news online, black online news consumers are much more likely than white consumers to follow up on these stories with an action. A real-time study asked more than 2,000 online news consumers twice a day over the course of a week (Feb. 24-March 1, 2016) whether they got news online in the past two hours and, if so, what their experience was with that news. Those who did get news online were asked whether they took one of six types of follow-up actions: speaking with someone either in person or over the phone; searching for additional information; posting, sharing or commenting on a social networking site; sending an article to someone by email or text message; bookmarking or saving the news for later; and commenting on a news organization’s webpage. Black online news consumers took at least one of these actions two-thirds (66%) of the time on average. That is 17 percentage points higher than whites (49%). By comparison, online news consumers overall took a follow-up action 52% of the time. Blacks were more likely than whites to act upon online news in two particular ways: speaking with someone offline and saving news for later. Black online news consumers, on average, spoke with someone about the news they got 38% of the time, compared with 29% of the time for whites. They were also slightly more likely than whites to bookmark or save a news article for later, though the rate that this was done was quite low for both groups (7% vs. 4%). These differences are reinforced by past research. A case study of local news habits in Macon, Georgia, by Pew Research Center found that black residents were more likely than white residents to engage in a number of news-related activities, such as calling into a TV or radio program, commenting on a local government website or submitting their own news content to a news outlet or website. Nonetheless, black online news consumers in the real-time study were not as likely to deliberately seek out their news. Instead, they were more likely to get online news while doing something else online, doing so 46% of the time on average, 12 percentage points higher than whites. By contrast, white consumers deliberately sought out their news 43% of the time, compared with about a third of the time for blacks (32%). This coincides with how blacks and whites get their news online. Black online news consumers are less likely to go directly to a news organization’s website or app; on average, black consumers did so 28% of the time, compared with 39% for whites. Additionally, blacks got online news through social media 41% of the time, on average, and whites did so 33% of the time. While this is not statistically different by traditional standards, the higher percentage among black online news consumers is in line with previous research showing that blacks get news from social media at a higher rate than whites.